As Vice President of Global Human Rights at Mars, Incorporated, Marika leads global human rights strategy, policy, and governance. Marika is also currently leading the Thriving People pillar of the global Mars Sustainable in a Generation Plan, which is focused on driving meaningful improvements in income, human rights and women’s empowerment across the Company’s value chain. Her human rights portfolio includes company operations, supplier workplaces and extended supply chains across 85 countries, with an emphasis on modern slavery and child labor. 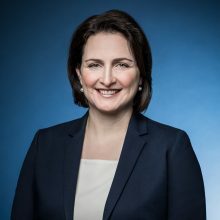 She heads the Mars strategic partnership with Verité, working with the global labor and human rights organization to create insight and action on human rights issues. And as co-chair of the Consumer Goods Forum’s taskforce on forced labor, she is helping to mobilize 400 of the world’s leading consumer goods companies to take action on this critical issue. Marika joined Mars in 2015 after a decade with The Coca-Cola Company, where she led sustainability and international affairs strategies and programs in areas including economic development, affordable nutrition and human rights. She developed Coca-Cola’s program to enable the economic empowerment of 5 million women entrepreneurs in its value chain – 5by20 – which has reached 2.4 million women since 2010. She also developed award-winning, multi-stakeholder global partnerships with UN Women, Oxfam, the Bill & Melinda Gates Foundation and USAID. Marika began her career in the non-profit sector at Oxfam America, focused on sustainable agriculture and human rights, and serving as an AmeriCorps fellow addressing hunger and poverty in rural communities. She holds a Master’s in Public Policy from Harvard University’s Kennedy School of Government. She is a member of the Aspen Institute’s Leaders Forum and in 2010 she served as an Aspen Institute First Movers Fellow. She lives in the Washington, DC area with her husband and three children.